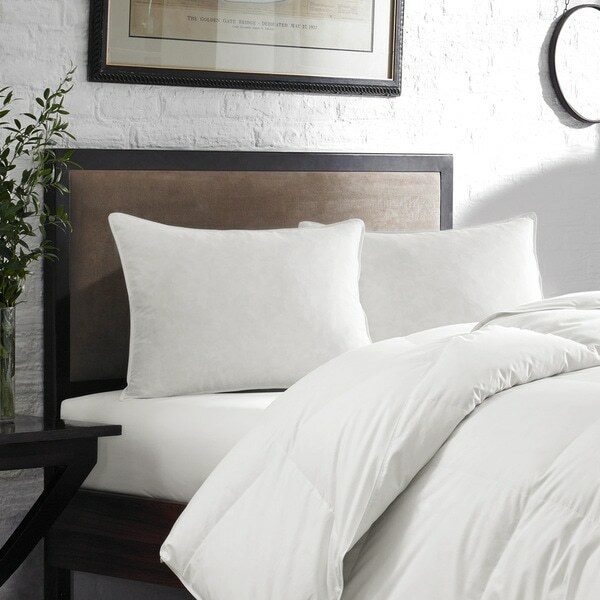 This is the perfect medium-density goose feather pillow from an iconic American Brand. Featuring a removable cream-colored protector, this pillow features a hypoallergenic blend of ten-percent grey goose down and ninety-percent grey goose feathers. A good pillow, but look twice when you order if you think you are buying a PAIR of pillows. You'll only get one. It comes tightly packed in a cardboard box so when you slit open the box with a utility knife you will also slit open the pillow. But that lets you see that the pillow is indeed filled with really nice feathers. In fact, filled so full of really nice feathers that it will bend your neck in a ninety degree angle when you rest your head on it. Aside from those details, it is a really nice pillow. the best goose feather pillows ever; this is my third purchase of them (for other bedrooms), and I recommend them highly. They come with a removable outer cover as well (great for keeping them even cleaner). A great pillow at a great price! The pillows were exactly as I expected. The Eddie Bauer goose feather pillows were exactly as described and well worth what I paid for them. I would recommend them. My husband loves these pillows. 100% feather. A year later, and he can still fluff them. This feather pillow is so comfortable I can fluff it up or press it down and it ajust perfectly to my head. Its feels soft when I lay my head on it and firm enough to hold my neck so I sleep good all night. Not for back-sleepers, but comfy and full for me as a side-sleeper! Very full of body and 'look' great as well. These are my 2nd feather pillow purchase, and I'm happy with them. At first I was not sure about purchasing the pillow but in the end I decided to take a chance. I bought to pillows and they were exactly as desscribed and the pillow protector was very nice. They are perfect size and would highly recommend! Under the specs, it says the filling is goose down, but it appears actually to be feathers. The pillow feels bumpy due to the size of the feathers. I haven't slept on it yet, but it looks like the quills could poke your cheek. This is a well made pillow. Plush, with just enough loft. But be aware it is not predominately down. When I purchased it goose "down" was called out in the name which enticed me to buy it. It looks like Overstock has changed the name since then. Regardless, it's a decent pillow for the price. My husband loves his new pillow. It is well made. It's not too "fat" or too "flat" but "just right." He had tried several stuffed and foam pillows which weren't as malleable as the down. Feathers poking out of casing hurt! I gave these for a gift and my step daughter loved them. I've had these for 3 years now and they are still in good shape. I wash them and they hold up. Have not had to reorder but will do so when the time comes and hope Overstock is still carrying them. They are nice. Love the pillows - best I have ever bought. Excellent and very comfy pillows. Bought for some family also and they agree. I'll definitely purchase this pillow again! Good quality - would buy it definitely again. I was disappointed in this pillow. It flattened out far too quickly. I was constantly punching it to fluff it up. In retrospect, I would have looked for a more dense fill. Love this pillow so comfy and solid but not overly mashable does the job my daughter now wants one now so I'll probaly be ordering another one very soon. I so wanted these to be like the Eddie Bauer pillows we purchased @ 6 years ago. I ordered 3 but only opened one box and knew the quality was not what I wanted. There were so many sticky quill pieces inside. Returning and searching for pillows more like we want. Still love Eddie Bauer though. I've always been happy with Eddie Bauer bedding. I also liked that these are 90/10 feather to down. Can't beat the price as well. I need some guest pillows and these look nice.